SE Washington DC (also known as Southeast DC) is located south of East Capitol Street and east of South Capitol Street. It is north of Prince George's County, Maryland and east of the Joint Base Anacostia Boiling (Naval Support Facility). The Anacostia River runs through the quadrant. Major attractions in SE Washington DC include Capitol Hill, the Supreme Court, the Library of Congress, the Washington Navy Yard, Fort Dupont Park, the Anacostia Waterfront, Eastern Market, St. Elizabeths Hospital, RFK Stadium, Nationals Park, the Frederick Douglass National Historic Site and the Anacostia Community Museum. SE Washington DC has a mixed population with politicians and government employees, journalists, professionals, and students residing in the Capitol Hill neighborhood and a lower-income predominantly African American population living in the neighborhoods south of the Anacostia River. The area is undergoing a massive transformation and is one of the city’s fastest-growing in terms of employment, entertainment and residential growth. 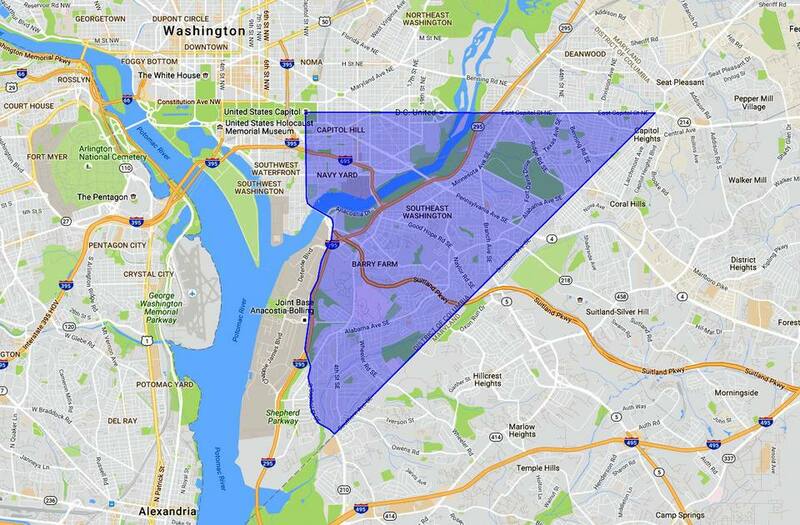 This map shows the boundaries of SE Washington, DC. Zip codes in SE include 20003, 20374, 20032, 20020, and 20019. This map shows more details of the major points of interests and tourist attractions in the SE quadrant of Washington DC. Major attractions include the Supreme Court, the Library of Congress, the Washington Navy Yard, Eastern Market, RFK Stadium, Nationals Park, the Frederick Douglass National Historic Site and many more. Anacostia - The historic district along the river is listed on the National Register of Historic Places. It was home to the human rights leader Frederick Douglass. Barry Farm - The SE DC neighborhood was renowned as a significant post-Civil-War settlement of free Blacks and freed slaves. The neighborhood was originally part of James Barry’s farm, which extended from the Anacostia River to what is now known as Garfield Heights. It now contains 432 units of public housing that is managed by the DC Housing Authority. Congress Heights - The residential SE DC neighborhood, near Joint Base Anacostia Boiling and Martin Luther King Jr. Avenue is a gentrifying area. Major projects planned for redevelopment include the St. Elizabeths West Campus, the area surrounding the Congress Heights Metro station and Camp Simms.